© 2017 Jordan and Jones. Radial head fractures are common elbow injuries in adults and are frequently associated with additional soft tissue and bone injuries. A literature search was performed and the authors’ personal experiences are reported. Mason type I fractures are treated non-operatively with splinting and early mobilisation. The management of Mason type II injuries is less clear with evidence supporting both non-operative treatment and internal fixation. The degree of intra-articular displacement and angulation acceptable for non-operative management has yet to be conclusively defined. Similarly the treatment of type III and IV fractures remain controversial. Traditional radial head excision is associated with valgus instability and should be considered only for patients with low functional demands. Comparative studies have shown improved results from internal fixation over excision. Internal fixation should only be attempted when anatomic reduction and initiation of early motion can be achieved. Authors have reported that results from fixation are poorer and complication rates are higher if more than three fragments are present. Radial head arthroplasty aims to reconstruct the native head and is indicated when internal fixation is not feasible and in the presence of complex elbow injuries. Overstuffing of the radiocapitellar joint is a frequent technical fault and has significant adverse effects on elbow biomechanics. Modular design improves the surgeon’s ability to reconstruct the native joint. Two randomised controlled trials have shown improved clinical outcomes and lower complication rate following arthroplasty when compared to internal fixation. We have presented details regarding the treatment of various types of radial head fractures - further evidence, however, is still required to provide clarity over the role of these different management strategies. Keywords: Radial head fracture, Radial head replacement, Internal fixation, Elbow, Elbow biomech. Radial head fractures constitute 3% of all fractures [1, 2] and 33% of adult elbow fractures . The injury occurs more commonly in females and in middle-aged patients . The mechanism of injury typically involves a fall onto an outstretched hand in a pronated position, which creates an axial load across the elbow. Mason originally classified these fractures  and this was later modified by Broberg and Morrey to include the parameters of displacement and size . Table (1) illustrates the classification system described by Mason and radiographic examples are demonstrated in (Figs. 1-4). Table 1. Mason classification of radial head fractures . Fig. (1). Anteroposterior (AP) and lateral views of a Mason type I injury. Fig. (2). AP and lateral views of a Mason type II injury. Fig. (3). AP and lateral views of a Mason type III injury. The radial head is a secondary restraint to valgus force and is responsible for 30% of the support in this direction. Following disruption of the medial collateral ligament (MCL), the radial head is the main stabiliser against valgus and compressive forces [11-13]. Therefore, in the presence of a MCL injury, radial head excision further exacerbates valgus instability. In these cases radial head arthroplasty is capable of restoring stability [14-16]. In addition, the radial head has been shown to act as a constraint to posterolateral , axial  and varus loading . Restoration of radiocapitellar contact during management is critical to coronal plane and longitudinal stability . Radial head fractures are frequently associated with soft tissue and bone injuries . These injuries will be dependent on mechanism; a valgus compressive force is likely to compromise the medial collateral ligament, whereas a supination injury will injure the lateral collateral followed by anterior and posterior capsule which may include the coronoid process . Radial head fractures that occur in association with ulnohumeral dislocation, coronoid fractures and ligamentous compromise are known as terrible triad injuries. Therefore, it is important to assess for associated injuries both clinically and radiologically. Clinical examination should be inclusive of valgus/varus strain testing and the pivot shift test for posterolateral instability. Computed tomography (CT) can play a role in the detection of concomitant fractures but has only been shown to moderately improve inter-observer reliability in classification of these fractures . Fig. 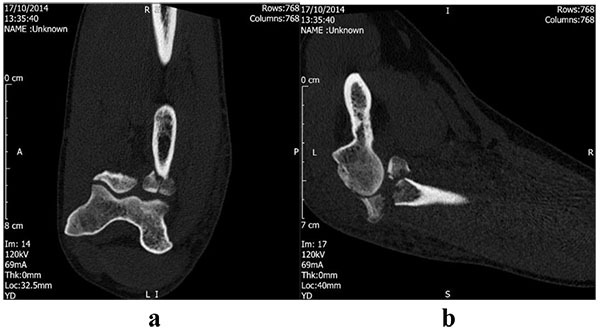 (5) demonstrates a reconstructed CT image of a type IV injury and illustrates an associated coronoid fracture. Acute magnetic resonance imaging reveals a high proportion of concomitant injuries; lateral collateral ligament 57%, capitellum injuries 38%, loose osteochondral fragments 5%, medial collateral ligament 2% and coronoid fracture 2% . However, only 5% of these injuries identified on MR were found to be clinically significant during follow up . Fig. (4). AP and lateral views of a Mason type IV injury. Fig. (5). Reconstructed CT image of a type IV injury with an associated coronoid fracture. Many fractures of the head of the radius can be treated non-operatively. This includes Mason type I fractures involving less than 25% of the radial head and a small intra-articular step (<2mm). Other authors have reported that even large displaced fractures, which do not interfere with rotation, can be successfully managed nonoperatively with early mobilisation [24, 25]. Retrospective case series with long follow up have reported high levels of satisfaction; Akesson et al. reported that 82% of their 49 patients had no subjective complaints at a mean of 19 years; however six patients had required radial head excision for suboptimal outcomes . Duckworth et al. noted similar functional outcomes following non-operative and operative fixation of displaced and comminuted radial head fractures . Non-operative treatment typically involves splinting for comfort before early motion to avoid elbow stiffness associated with prolonged immobilisation. One study demonstrated improved functional outcomes after mobilisation at either day one or three compared to mobilisation on day seven . Therefore mobilisation and physiotherapy should be encouraged as early as pain allows when treating radial head fractures non-operatively. Aspiration of the associated intra-articular haematoma reduces pressure and pain and so can be considered as an adjunct to non-operative treatment . The importance of the radial head to elbow biomechanics and function has led to interest in both its fixation and reconstruction following trauma . The described indications for surgical intervention are variable but include comminution, involvement of a large proportion of articular surface, mechanical block, loose bodies and presence of associated elbow injuries. Previously authors have suggested that the instability of the fracture is probably more important than displacement when considering surgical treatment . However surgical intervention is associated with complications that include posterior interosseous nerve (PIN) injury, loss of fixation, fracture displacement, elbow stiffness, radiocapitellar arthritis and infection. Surgical exposure is typically achieved through either the Kocher interval between anconeus and extensor carpi ulnaris  or the Kaplan interval between the extensor carpi radialis longus and extensor digitorum communis . The mean distance from radiocapitellar joint to the PIN ranges from 40 to 48mm and is dependent on arm position. Maintaining the forearm in pronation will move the nerve away from the surgical field and reduce risk of injury . Radial head excision has been a traditional treatment for comminuted fractures. A number of case series with long-term follow-up have demonstrated that the majority of patients can be treated successfully using this technique. Iftimie et al. reported on 51 patients treated for Mason type II to IV fractures followed up for a mean of 17 years and showed that 96% had good or excellent outcome according to the Mayo Elbow Performance Score . A systematic review included four studies and concluded that the majority of patients undergoing radial head excision have a good functional result. However an increase in both valgus angle (range 5 to 11 degrees) and proximal radial migration (range 1.5 to 2.5mm) was noted . Antuna et al. reported the outcomes of patients undergoing surgery under the age of 40 years at a mean of 25 years follow up and showed that 92% had good or excellent outcomes, although the authors demonstrated that a high proportion had radiographic evidence of arthritis or some degree of instability on examination . Despite these results concerns regarding the long-term effects of radial head excision have been raised. Excision compromises the stability of the elbow [14, 35], quantified by a cadaveric study as an increased posterolateral laxity of 18.6 degrees . Radial head excision still provides a treatment option for these injuries but is typically reserved for low demand and sedentary patients or after failed alternative management. Contraindications to excision include a coronoid fracture, MCL deficiency and forearm interosseous ligament injury. In addition some authors have recommended avoidance of excision of greater than 25% of radial head because of the risk of painful clicking or symptomatic instability [37, 38]. Ideally this should only be attempted when anatomic reduction, restoration of congruity and initiation of early motion can be achieved . An example case is illustrated in Figs. (6 and 7) where a type IV injury has been managed by reconstruction and fixation of the radial head. This can be easier to achieve with simple fracture patterns, for example in Mason type II fractures where good outcomes have been described . Some studies reporting both type II and III fractures have also shown good or excellent outcomes . However complex fractures are associated with high early failure, non-union and complications [40, 41]. Ring et al. concluded that ORIF may be less optimal with greater than three fragments . Comparison of different techniques that included mini-screws, fine threaded wires, Kirschner wires and T-mini-plates demonstrated that threaded wires were optimal for fracture reduction and T-mini-plates provided the least stability . Therefore internal fixation should be considered in radial head fractures with three or fewer fragments but if additional injuries are present these should be addressed separately. Fig. (6). Pre-operative CT images of type IV injury. Fig. (7). Post-operative plain radiographs after reconstruction and internal fixation of type IV radial head fracture. The aim of radial head arthroplasty is reconstruct the anatomy of the native head. The anatomy of the radial head is complex with an elliptical shape, a complex angulation at the radial neck and articulation with the proximal ulna, capitellum and lateral tip of the trochlea . Although various prosthetic materials have been used, the commonest have been silicone and metal. Concerns have been raised regarding silastic implants including fragmentation with resultant synovitis and joint erosion . Silicone implants also provide suboptimal stability against valgus and compressive forces [12, 44-46]. Metal prostheses have been shown to have a higher compressive rigidity and are capable of resisting forces produced across the elbow [12, 46, 47]. Implants are available in monobloc and modular systems. Traditional monobloc designs are technically more demanding  whereas modular systems allow the surgeon to alter the height and diameter to facilitate accurate reconstruction . A bipolar design is also available and theoretically improves capitellar tracking, increases radiocapitellar contact areas, and decreases joint contact pressures [16, 50]. Bipolar implants have not been shown to provide superior stability  and can be associated with dissociation , maltracking  and osteolysis . Uncemented prosthesis allows the stem to rotate within the medullary canal effectively creating a bipolar prosthesis . These have also had complications reported, with a study assessing press-fit radial head prostheses concluding that early loosening is common, and often leads to severe osteolysis requiring prosthetic removal . Arthroplasty is indicated for comminuted fractures, especially those with 3 or more fragments where internal fixation is not feasible and in the presence of complex elbow injuries . 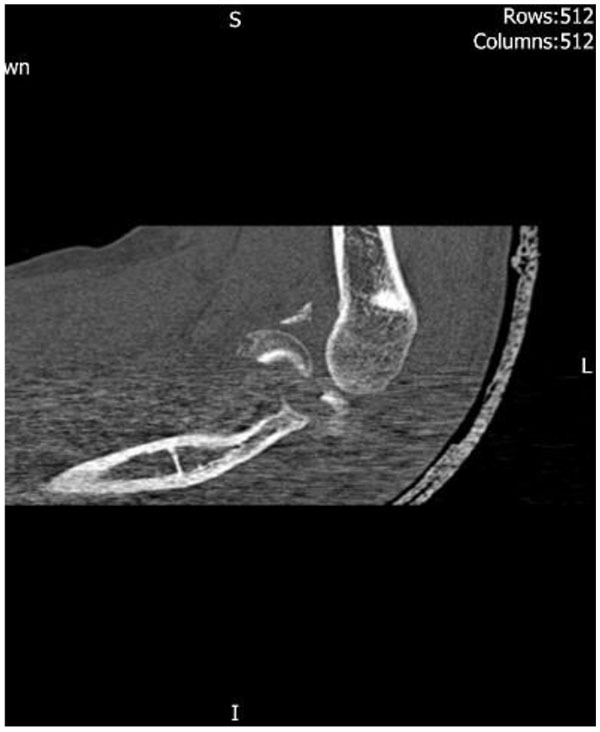 An example of a type III fracture managed by arthroplasty is illustrated in Figs. (8 and 9). A number of case series have demonstrated that this technique can be effective; Grewal et al. retrospectively reviewed 26 patients using a modular, metallic, monobloc arthroplasty with a loose press-fit stem and showed high satisfaction, mean DASH 24.4 and mean Mayo Elbow Performance Index (MEPI) of 83, and no revision surgery at two years . Zunkiewicz et al. evaluated 29 patients treated using a bipolar prosthesis with a loose stem and a mean follow-up of 34 months, and reported a mean MEPI score of 92 with only two patients requiring further surgery . Fig. (8). Pre-operative CT images of type III injury. Fig. (9). Post-operative plain radiographs after arthroplasty of type III fracture. The most common technical fault when performing arthroplasty is overstuffing of the radiocapitellar joint. Shortening or lengthening by as little as 2.5mm can have a significantly adverse effect on elbow biomechanics . A discrepancy can lead to high capitellar contact pressures, capitellar erosion, instability and restricted range of motion [14, 15, 33, 57-60]. To aid sizing, the implant can be checked against the reconstructed native head or by using the proximal edge of the lesser sigmoid notch as a marker for the proximal end of the radial head prosthesis [61, 62]. Complications of radial head arthroplasty include radiocapitellar arthritis, stem loosening, failed and/or fractured components, instability, dislocation, and infection . A recent systematic review reported on 12 case series and reported revision rates ranging from 0 to 20%, although the methodology of these studies varied as did the length of follow up . Specific complication rates included peri-prosthetic radiolucency from 0 to 100% and capitellar erosion from 0 to 72% . Duckworth et al. recently reported revision and removal rate of 28% at a mean of 6.7 years after uncemented monopolar prosthesis for acute fractures . The authors demonstrated that a lower age and the use of silastic implants were independent risk factors for revision . Similarly van Riet et al. evaluated 47 cases of failed metallic radial head prosthesis and reported that common causes for revision were painful aseptic loosening (66%) and instability (19%) . Currently, there is a lack of clear evidence available regarding the treatment of Mason II fractures [49, 65]. Kaas et al. reported that non-operative treatment was successful in 80% compared to 93% after ORIF  whilst Struijs et al. demonstrated residual pain in 42% of non-operative patients versus 32% in surgically treated patients . The Morrey modification added the presence of a mechanical block or greater than 2mm displacement as indications for surgery . However evidence is available that contradicts this with fixation failing to improve outcomes in 2 or 3mm of displacement  and a high subjective satisfaction in 82% of patients with 2 to 5mm displaced type II fractures at a mean 19 years follow up . Few comparative studies are published and being non-randomised retrospective designs they have inherent weaknesses. Yoon et al. compared 30 cases of partial articular fracture with 2-5mm displacement managed non-operatively with 30 undergoing internal fixation and showed similar function, strength and range of motion . In contrast Zarattini et al. reported improved functional scores, residual pain, range of motion and strength after internal fixation when compared to radial excision . The treatment of type III and IV fractures also remains controversial . These patients should be considered to have a complex instability injury due to the high rate of associated injuries, which should be simultaneously addressed for a successful outcome . Traditional radial head excision is associated with valgus instability, stiffness and proximal radial migration [71, 72] and should be considered only for patients with low functional demands. Two non-randomised studies compared excision and internal fixation for comminuted displaced fractures and reported improved functional outcomes and a lower prevalence of arthritis after fixation [73, 74]. Two randomised controlled trials comparing internal fixation and arthroplasty for unstable, multi-fragmented radial head fractures showed a better clinical result and lower complication rate following arthroplasty [75, 76]. The importance of the radial head in elbow biomechanics is becoming increasingly recognised and this has influenced the approach to fracture management. Type I fractures are managed non-operatively. The management of type II and III injuries remains controversial and further evidence in these areas is required. Factors to consider when making management decisions include the ability to achieve a successful reconstruction, elbow stability and the presence of associated injuries. van Riet RP, Van Glabbeek F, Neale PG, Bortier H, An KN, O’Driscoll SW. The noncircular shape of the radial head. J Hand Surg Am 2003; 28(6): 972-8. Caputo AE, Mazzocca AD, Santoro VM. The nonarticulating portion of the radial head: Anatomic and clinical correlations for internal fixation. J Hand Surg Am 1998; 23(6): 1082-90. Bryce CD, Armstrong AD. Anatomy and biomechanics of the elbow. Orthop Clin North Am 2008; 39(2): 141-154, v.
 Smith GR, Hotchkiss RN. Radial head and neck fractures: Anatomic guidelines for proper placement of internal fixation. J Shoulder Elbow Surg 1996; 5(2 Pt 1): 113-7. Giannicola G, Manauzzi E, Sacchetti FM, et al. Anatomical variations of the proximal radius and their effects on osteosynthesis. J Hand Surg Am 2012; 37(5): 1015-23. Morrey BF, An KN. Articular and ligamentous contributions to the stability of the elbow joint. Am J Sports Med 1983; 11(5): 315-9. Sellman DC, Seitz WH Jr, Postak PD, Greenwald AS. Reconstructive strategies for radioulnar dissociation: A biomechanical study. J Orthop Trauma 1995; 9(6): 516-22. Morrey BF, Tanaka S, An KN. Valgus stability of the elbow. A definition of primary and secondary constraints. Clin Orthop Relat Res 1991; (265): 187-95. Beingessner DM, Dunning CE, Gordon KD, Johnson JA, King GJ. 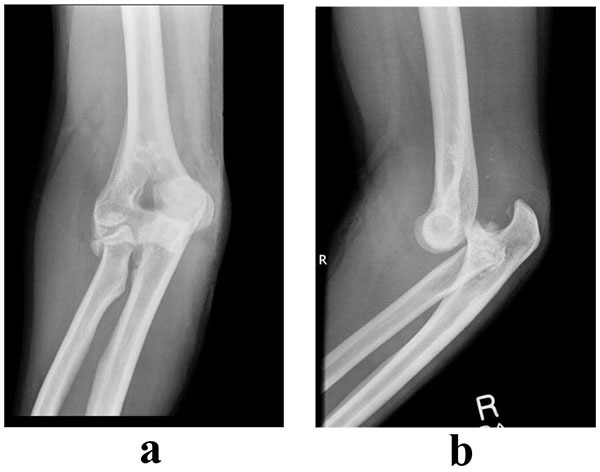 The effect of radial head excision and arthroplasty on elbow kinematics and stability. J Bone Joint Surg Am 2004; 86-A(8): 1730-9. King GJ, Patterson SD. Metallic radial head arthroplasty. Tech Hand Up Extrem Surg 2001; 5(4): 196-203. Pomianowski S, Morrey BF, Neale PG, Park MJ, O’Driscoll SW, An KN. Contribution of monoblock and bipolar radial head prostheses to valgus stability of the elbow. J Bone Joint Surg Am 2001; 83-A(12): 1829-34. Schneeberger AG, Sadowski MM, Jacob HA. 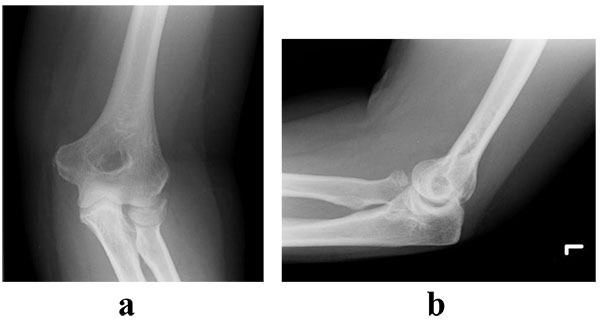 Coronoid process and radial head as posterolateral rotatory stabilizers of the elbow. J Bone Joint Surg Am 2004; 86-A(5): 975-82. Shepard MF, Markolf KL, Dunbar AM. Effects of radial head excision and distal radial shortening on load-sharing in cadaver forearms. J Bone Joint Surg Am 2001; 83-A(1): 92-100. Ruchelsman DE, Christoforou D, Jupiter JB. Current Concepts Review: Fracture of the radial head and neck. J Bone Joint Surg Am 2013; 95: 469-78.
 van Riet RP, Morrey BF. Documentation of associated injuries occurring with radial head fracture. Clin Orthop Relat Res 2008; 466(1): 130-4. O’Driscoll SW, Jupiter JB, King GJ, Hotchkiss RN, Morrey NF. The unstable elbow. J Bone Joint Surg 2000; 82: 724-32. Kaas L, van Riet RP, Turkenburg JL, Vroemen JP, van Dijk CN, Eygendaal D. Magnetic resonance imaging in radial head fractures: Most associated injuries are not clinically relevant. J Shoulder Elbow Surg 2011; 20(8): 1282-8. Duckworth AD, Clement ND, Jenkins PJ, Will EM, Court-Brown CM, McQueen MM. Socioeconomic deprivation predicts outcome following radial head and neck fractures. Injury 2012; 43(7): 1102-6. Paschos NK, Mitsionis GI, Vasiliadis HS, Georgoulis AD. Comparison of early mobilization protocols in radial head fractures. J Orthop Trauma 2013; 27(3): 134-9. Ditsios KT, Stavridis SI, Christodoulou AG. The effect of haematoma aspiration on intra-articular pressure and pain relief following Mason I radial head fractures. Injury 2011; 42(4): 362-5. Kocher T. Textbook of operative surgery 3rd ed. 1911. Kaplan EB. The etiology and treatment of epicondylitis. Bull Hosp Jt Dis 1968; 29(1): 77-83. Tornetta P III, Hochwald N, Bono C, Grossman M. Anatomy of the posterior interosseous nerve in relation to fixation of the radial head. Clin Orthop Relat Res 1997; (345): 215-8. Iftimie PP, Calmet Garcia J, de Loyola Garcia Forcada I, Gonzalez Pedrouzo JE, Giné Gomà J. Resection arthroplasty for radial head fractures: Long-term follow-up. J Shoulder Elbow Surg 2011; 20(1): 45-50. Charalambous CP, Stanley JK, Mills SP, et al. Comminuted radial head fractures: aspects of current management. J Shoulder Elbow Surg 2011; 20(6): 996-1007. Antuña SA, Sánchez-Márquez JM, Barco R. Long-term results of radial head resection following isolated radial head fractures in patients younger than forty years old. J Bone Joint Surg Am 2010; 92(3): 558-66. Jensen SL, Olsen BS, Søjbjerg JO. Elbow joint kinematics after excision of the radial head. J Shoulder Elbow Surg 1999; 8(3): 238-41. Jensen SL, Deutch SR, Olsen BS, Søjbjerg JO, Sneppen O. Laxity of the elbow after experimental excision of the radial head and division of the medial collateral ligament. Efficacy of ligament repair and radial head prosthetic replacement: A cadaver study. J Bone Joint Surg Br 2003; 85(7): 1006-10. Beingessner DM, Dunning CE, Gordon KD, Johnson JA, King GJ. The effect of radial head fracture size on elbow kinematics and stability. J Orthop Res 2005; 23(1): 210-7. King GJ, Evans DC, Kellam JF. Open reduction and internal fixation of radial head fractures. J Orthop Trauma 1991; 5(1): 21-8. Esser RD, Davis S, Taavao T. Fractures of the radial head treated by internal fixation: Late results in 26 cases. J Orthop Trauma 1995; 9(4): 318-23. Heim U. [Surgical treatment of radial head fracture]. Z Unfallchir Versicherungsmed 1992; 85(1): 3-11. Koslowsky TC, Mader K, Dargel J, Koebke J, Hellmich M, Pennig D. Reconstruction of a Mason type-III fracture of the radial head using four different fixation techniques. An experimental study. J Bone Joint Surg Br 2007; 89(11): 1545-50. Vanderwilde RS, Morrey BF, Melberg MW, Vinh TN. Inflammatory arthritis after failure of silicone rubber replacement of the radial head. J Bone Joint Surg Br 1994; 76(1): 78-81. Carn RM, Medige J, Curtain D, Koenig A. Silicone rubber replacement of the severely fractured radial head. Clin Orthop Relat Res 1986; (209): 259-69. Morrey BF, Askew L, Chao EY. Silastic prosthetic replacement for the radial head. J Bone Joint Surg Am 1981; 63(3): 454-8. King GJ, Zarzour ZD, Rath DA, Dunning CE, Patterson SD, Johnson JA. 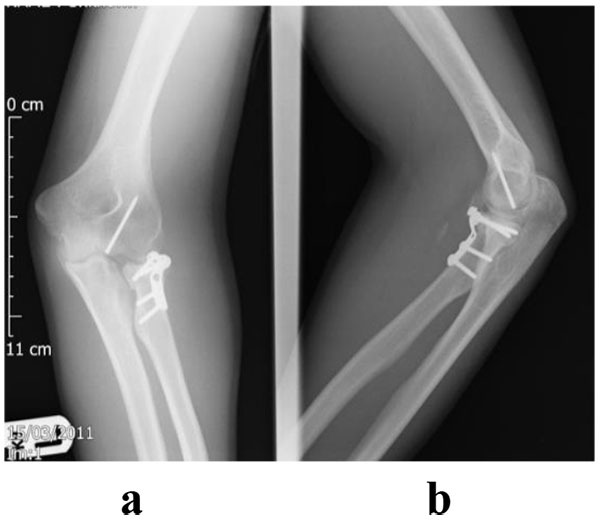 Metallic radial head arthroplasty improves valgus stability of the elbow. Clin Orthop Relat Res 1999; (368): 114-25. Bain GI, Ashwood N, Baird R, Unni R. Management of Mason type III radial head fractures with a titanium prosthesis, ligament repair and early mobilization 2005. King GJ, Zarzour ZD, Patterson SD, Johnson JA. An anthropometric study of the radial head: implications in the design of a prosthesis. J Arthroplasty 2001; 16(1): 112-6. Kaas L, Struijs PA, Ring D, van Dijk CN, Eygendaal D. Treatment of Mason type II radial head fractures without associated fractures or elbow dislocation: a systematic review. J Hand Surg Am 2012; 37(7): 1416-21. Moungondo F, El Kazzi W, van Riet R, Feipel V, Rooze M, Schuind F. Radiocapitellar joint contacts after bipolar radial head arthroplasty. J Shoulder Elbow Surg 2010; 19(2): 230-5. Hartzler RU, Morrey BF, Steinmann SP, Llusa-Perez M, Sanchez-Sotelo J. 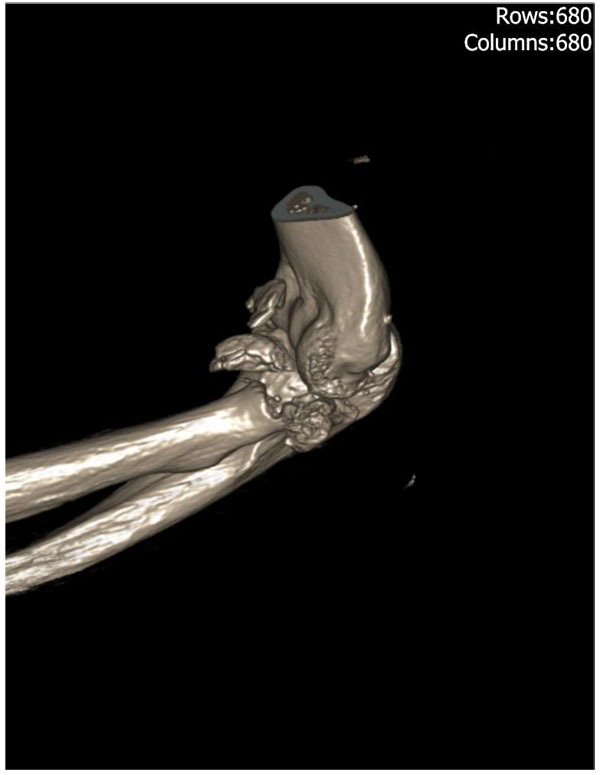 Radial head reconstruction in elbow fracture-dislocation: monopolar or bipolar prosthesis? Clin Orthop Relat Res 2014; 472(7): 2144-50. Herald J, O’Driscoll S. Complete dissociation of a bipolar radial head prosthesis: A case report. J Shoulder Elbow Surg 2008; 17(6): e22-3. Popovic N, Lemaire R, Georis P, Gillet P. Midterm results with a bipolar radial head prosthesis: radiographic evidence of loosening at the bone-cement interface. J Bone Joint Surg Am 2007; 89(11): 2469-76. 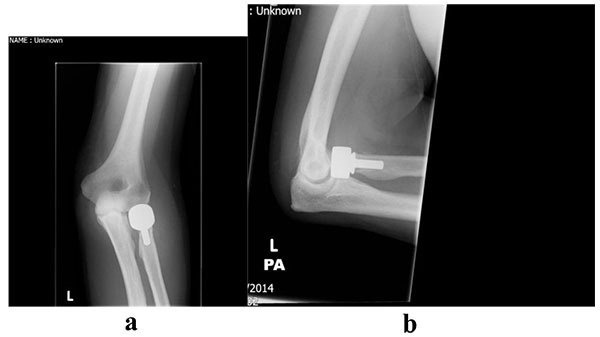 Flinkkilä T, Kaisto T, Sirniö K, Hyvönen P, Leppilahti J. Short- to mid-term results of metallic press-fit radial head arthroplasty in unstable injuries of the elbow. J Bone Joint Surg Br 2012; 94(6): 805-10. Grewal R, MacDermid JC, Faber KJ, Drosdowech DS, King GJ. Comminuted radial head fractures treated with a modular metallic radial head arthroplasty. Study of outcomes. J Bone Joint Surg Am 2006; 88(10): 2192-200. Zunkiewicz MR, Clemente JS, Miller MC, Baratz ME, Wysocki RW, Cohen MS. Radial head replacement with a bipolar system: a minimum 2-year follow-up. J Shoulder Elbow Surg 2012; 21(1): 98-104. Van Glabbeek F, Van Riet RP, Baumfeld JA, et al. Detrimental effects of overstuffing or understuffing with a radial head replacement in the medial collateral-ligament deficient elbow. J Bone Joint Surg Am 2004; 86-A(12): 2629-35. Athwal GS, Rouleau DM, MacDermid JC, King GJ. Contralateral elbow radiographs can reliably diagnose radial head implant overlengthening. 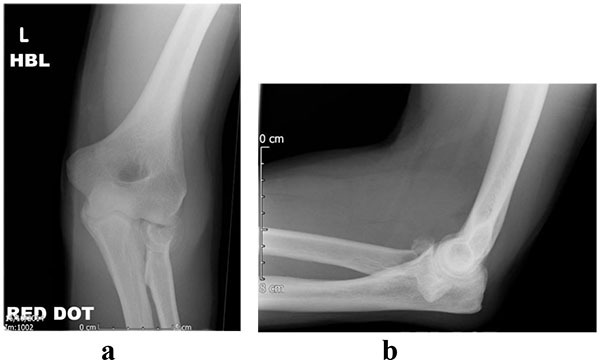 J Bone Joint Surg Am 2011; 93(14): 1339-46. Doornberg JN, Parisien R, van Duijn PJ, Ring D. Radial head arthroplasty with a modular metal spacer to treat acute traumatic elbow instability. J Bone Joint Surg Am 2007; 89(5): 1075-80. Frank SG, Grewal R, Johnson J, Faber KJ, King GJ, Athwal GS. Determination of correct implant size in radial head arthroplasty to avoid overlengthening. J Bone Joint Surg Am 2009; 91(7): 1738-46. Van Riet RP. Van Glabbeek, de Weerdt W, Oemar J, Bortier H. Validation of the lesser sigmoid notch of the ulna as a reference point for accurate placement of a prosthesis for the head of the radius: a cadaveric study. J Bone Joint Surg Br 2007; 89: 413-9. Doornberg JN, Linzel DS, Zurakowski D, Ring D. Reference points for radial head prosthesis size. J Hand Surg Am 2006; 31(1): 53-7. Duckworth AD, Wickramasinghe NR, Clement ND, Court-Brown CM, McQueen MM. Radial head replacement for acute complex fractures: what are the rate and risks factors for revision or removal? Clin Orthop Relat Res 2014; 472(7): 2136-43.
 van Riet RP, Sanchez-Sotelo J, Morrey BF. Failure of metal radial head replacement. J Bone Joint Surg Br 2010; 92(5): 661-7. Struijs PA, Smit G, Steller EP. Radial head fractures: effectiveness of conservative treatment versus surgical intervention. A systematic review. Arch Orthop Trauma Surg 2007; 127(2): 125-30. Morrey BF. The elbow and its disorders 3rd ed. 2000. Furey MJ, Sheps DM, White NJ, Hildebrand KA. A retrospective cohort study of displaced segmental radial head fractures: is 2 mm of articular displacement an indication for surgery? J Shoulder Elbow Surg 2013; 22(5): 636-41. 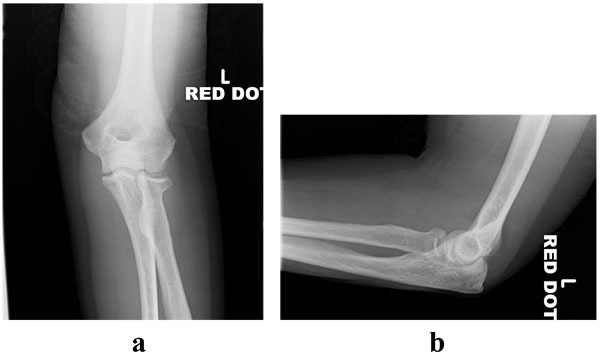 Yoon A, King GJ, Grewal R. Is ORIF superior to nonoperative treatment in isolated displaced partial articular fractures of the radial head? Clin Orthop Relat Res 2014; 472(7): 2105-12. Zarattini G, Galli S, Marchese M, Mascio LD, Pazzaglia UE. The surgical treatment of isolated mason type 2 fractures of the radial head in adults: comparison between radial head resection and open reduction and internal fixation. J Orthop Trauma 2012; 26(4): 229-35. Furry KL, Clinkscales CM. Comminuted fractures of the radial head. Arthroplasty versus internal fixation. Clin Orthop Relat Res 1998; (353): 40-52. McDougall A, White J. Subluxation of the inferior radio-ulnar joint complicating fracture of the radial head. J Bone Joint Surg Br 1957; 39-B(2): 278-87. Mikíc ZD, Vukadinovíc SM. Late results in fractures of the radial head treated by excision. Clin Orthop Relat Res 1983; (181): 220-8. Ikeda M, Sugiyama K, Kang C, Takagaki T, Oka Y. Comminuted fractures of the radial head. Comparison of resection and internal fixation. J Bone Joint Surg Am 2005; 87(1): 76-84. Lindenhovius AL, Felsch Q, Doornberg JN, Ring D, Kloen P. Open reduction and internal fixation compared with excision for unstable displaced fractures of the radial head. J Hand Surg Am 2007; 32(5): 630-6. Ruan HJ, Fan CY, Liu JJ, Zeng BF. A comparative study of internal fixation and prosthesis replacement for radial head fractures of Mason type III. Int Orthop 2009; 33(1): 249-53.